General Gagandeep Singh Bakshi, a highly decorated retired officer from the Jammu and Kashmir Rifles, a veteran of many battles and skirmishes on the LoC, a Vishisht Seva Medal winner who led a battalion during the Kargil War, is now a regular on TV panels, where he has developed a reputation for his emotional and unabashedly nationalist views. Gen Bakshi recently addressed a gathering of IIT Madras students. Once again, as we have seen repeatedly in the recent past, a bunch of radical leftist students along with some Kashmiris objected to General Bakshi’s speech for suggesting that the only way peace could be brought to Kashmir was to divide Pakistan into 4 parts. These miscreants then tried to raise slogans against him and stop him from speaking. This falls into a set pattern as was noted in JNU where leftists along with Kashmiris raised anti-India slogans like “Bharat Tere Tukde Honge Inshallah Inshallah” in the name of free speech. Only this time, they could not get away with it so easily as other students out-shouted this leftist lobby and did not let them disrupt Gen Bakshi’s speech. Earlier this year, we had seen a similar episode where self-proclaimed proponents of “free speech”from JNU, who belonged to the Left ideology opposed a talk by Baba Ramdev on their campus. “Left” with no other recourse due to failure of strong-arm tactics on campus, a student wrote a letter supposedly to the Director of IIT-M but in reality addressed to a wider audience through compliant media houses ever eager to give space to such nefarious elements, labelling Gen Bakshi’s talk a “hate speech” and “controversial”. 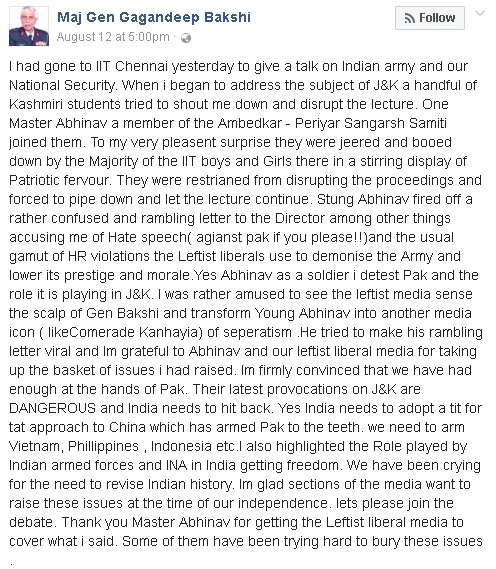 General Bakshi retorted in style on Facebook and called out the bluff, pointing out that the alleged students were in fact Leftists of Ambedkar-Periyar group who had no popular support and that the majority of IIT students who were present there jeered and booed the Ambedkar-Periyar group into silence. He stood completely by his statements and again pointed out that Pakistan’s constant provocations on J&K were dangerous and that India needed to hit back. Two other students Deepak Ojha and Chirag Khalde who were present at the talk also wrote in defence of Gen Bakshi and pointed out numerous factual inaccuracies in the claims made by Abhinav in his letter. And thus began a massive assault on Gen Bakshi by alleged journalists, AAP and Congress politicians and hidden and actual spokespersons of the party. Mihir Sharma, a journalist whose political preferences and depths of thuggery aren’t exactly a secret, called Gen Bakshi’s talk “pretty deranged“. I’m sure many in the audience would’ve retorted that a person making such remarks is more likely to be the one who is pretty deranged. Priyanka Chaturvedi of Congress went so far as to say that a “there is no bigger war monger than him“. Attacks on Gen Bakshi are not a new obsession for Congress people: another former Congress spokesman Tehseen Poonawalla had called Gen Bakshi an “idiot” and compared him to Javed Miandad of Pakistan! A well known Congress supporter pretending to be a neutral person, Sanjay Hegde, tried to mock Gen Bakshi for saying that Dehradun derived its name from Dronacharya and was originally called Dehra Dron. Unfortunately for Sanjay Hegde and his supporters, this is mentioned in books on Uttarakhand and it is so well known, in fact, that several prominent educational institutions in Dehradun are named after Dronacharya. Moreover, Gen Bakshi taught at IMA Dehradun for three years, and obviously knows the place much better than most. Yet, for the sake of furthering an agenda, everything is fair game, and facts don’t matter at all. Another alleged journalist whose political preferences are pretty obvious through his social media feed, Salil Tripathi, openly abused Gen Bakshi, calling him a “poorly educated 56-inch mucchiwala“. The general of course, is a highly intelligent man and a prolific writer, having published 35 books and authored over 200 papers in leading research journals – probably much more than Tripathi may have done in his lifetime. But our ill-informed alleged journalists, blinded by agenda and hate, actively try to show their monopoly right over education. Ordinary citizens who feel for the country are labelled “hyper-nationalists” by this cabal. It took another common citizen to retort with a very appropriate label for the cabal – “hypo”-nationalists” – who have a deficiency of patriotism and love for their own nation that leads them to run down anyone who doesn’t. The sapling of anti-nationalism in the form of leftists installed by Indira Gandhi in our premier institutions is now producing its poisonous fruit that threatens the very integrity of India and bemoans calls for destruction of our notorious neighbour which constantly sponsors attacks against Indian civilians and armed forces. It has spread to journalism, politics, education, history, literature, social service and every field one can think of. Yet, Congress supporters and alleged “journalists” continue to back these poisonous elements against the very people protecting them from being killed – our armed forces. We have seen the same people lead movements against use of “pellets” on stone-pelters and acid-bombers attacking the armed forces in the valley following the death of one of the poster-boys of terrorism, Burhan Wani – who was called “son of school headmaster” by NDTV journalist Barkha Dutt. A pointed question on whether he was a terrorist or not, asked to Ms Dutt by a columnist, went unanswered. The threat to our nation from these developments, from the consistent refusal to recognise the enemy and blame our protectors for oppression, is now becoming more and more obvious, and increasingly, people are realising this and calling it out on the only medium they can: Social Media. It is heartening that the ordinary citizens of our nation are now fighting back against this distorted narrative of the “hypo”-nationalists and those who are responsible for creating it, and this fills me with immense hope and happiness. The narrative is being changed by the citizens of India who have the country’s interests at heart. This must now develop into a full blown movement to kill the poisonous tree and liberate India’s elite educational institutions from the grip of leftist anti-nationals who teach our children to hate our nation. To paraphrase Roosevelt: “We can. We will, We must”. Let’s do it.